Our toddlers occupy two rooms called “Ladybirds” and “Grasshoppers”. Each room is staffed by fully trained Nursery Nurses and a staff-to-child ratio of 1:4 is maintained at all times. The rooms are overseen by an experienced Room Leader supported by Senior Nursery Nurses. Whilst we always organise your child’s day around their individual needs, when they join the Toddlers’ group they encounter a simple structure to their day. At this age their independence and self-help skills are starting to emerge, and a flexible daily structure encourages them to continue their development through a range of learning experiences. The planning of your child’s learning and development is detailed and personalised and is overseen by their Key Person. All planning is based on careful observation of your child’s interests and developmental stage, and is designed to challenge them and extend their learning in a supportive and positive manner. 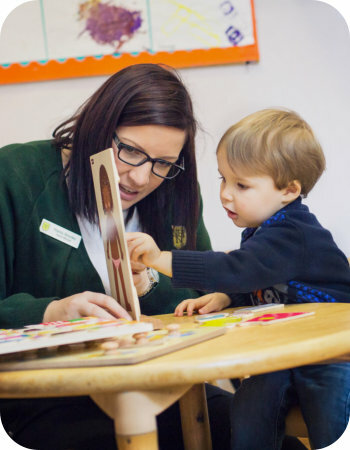 Children whose parents wish them to progress to Norfolk House School ordinarily leave the nursery and join Transition in the September preceding their fourth birthday. Whilst priority is given to children who have attended the nursery, a place at the school cannot be guaranteed. Parents who would wish their child to progress to the school are encouraged to apply as early as possible in order to secure a place. Both of our children have had a very happy time with you. All the staff have been excellent at bonding with them and making them feel part of the ‘family’ even though they are only there a few hours a week. You are very good at making the children feel valued and give parents lots of opportunity to get on board and work as a partnership with the nursery. Thank you very much – we have enjoyed our time immensely.